FAQ: What are my Brake Up-Grade options for a 2002-2005 WRX? What are my Brake Up-Grade options for a 2002-2005 WRX? Okay, if we are talking about brakes, there are a lot of options out there. First thing you should think about are tires. It doesn't matter if you have enough brake to stop a train if you don't have enough traction to take advantage of it. If you want to make a dramatic improvement in your braking, a good place to start is a good sticky tire. Beyond that, you definitely want Stainless Steel lines, and to up-grade to a DOT 4 brake fluid (this will give you better pedal feel, and more heat capacity to keep from boiling your fluid). You might also want to look at a Brake Master Cylinder Brace, this takes out most of the fire wall flex from the master cylinder, and also helps to improve pedal feel. The reason this is important is to make sure that as much of the force that you apply to the pedal makes it to your caliper, and also to let you know as soon as possible if your brake system is starting to fail because of heat build-up. Then as far as upgrading your brakes, you have a couple options. First would be to upgrade pads in your existing calipers. There are a lot of pad compounds out there, and they make a big difference. One reason that we carry Hawk pads is because of the wide range of compounds that they offer. Their street pad (the HPS or High Performance Street) is a very good pad for daily driving, and light track use. If you want to get more aggressive, the HP+ compound is great, but it will dust more, and wear out your rotors faster because of their higher coefficient of friction. If you are just driving around town, the HPS should be adequate, and if you still want more, get some HP+'s to swap out for the track. The next step would be to up-grade your caliper. One option is to upgrade to the Subaru 4-Pot brakes that were first used on the GC STI, and now on the 06-07 WRX. They are a direct bolt-on, and use the WRX factory rotors (in front). These give you more clamping force (because you have 4 pistons instead of 2), and your brake pad is slightly larger, however, because you are using the same sized rotor, your mechanical advantage has not improved. The nice thing about this set-up is that you don't have to go with a larger wheel (they will fit under stock WRX wheels with a 5mm spacer), and they aren't much heavier than the stock parts. Keep in mind that here again, there are a lot of pad compounds to choose from. We are currently using these calipers on the front of our Project Car which is a 2003 WRX with HP+ pads, with the stock calipers and HPS pads in the rear, and have had great results. Beyond that, the next step would be to go with the STI Brembo Brakes. These give you an increase in clamping force, and a lighter caliper (made of aluminum), and a larger rotor, so an increase in your mechanical advantage to stop the car. The larger rotor also has a better ability to disapate heat, but you pay a pretty big weight penalty. Also, because you are increasing the rotor size, they will not fit under stock WRX wheels (though they may fit under 06-07 wheels with spacers), so you may have to go with a 17" wheel just to get these to fit. Also, at this level, you would ideally want to up-grade the rear calipers too, and Brembo's kit is the easiest way to do this because the Subaru Factory parts are not a direct bolt on. 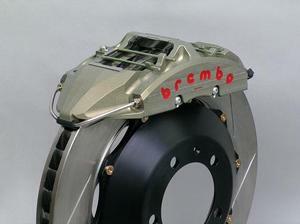 If you decide to go with the Brembo's, again, don't forget that there a lot of pad compounds out there to choose from, and that should be more than adequate for anything you are doing. You have an expert opinion on this one. I would care to try it out with in my project similar to this.